Here’s a tryout for an activity we’re considering including in volume 2 of DWWP. It’s a warm-up exercise whose goal is to activate your drawing and storytelling muscles at the same time. I’m not entirely sure how well it works so I would appreciate and comments on what follows. Better yet, if anyone is inspired I would love to see a few more attempts at this exercise. I’ll make the instructions as clear as possible. The copy in bold is what I have written for the textbook draft. 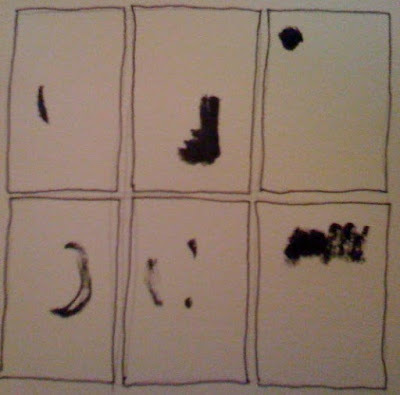 Get out your brush, ink it up, and, without thinking too hard or planning in advance, quickly make a single mark in each panel: a line, a squiggle, a blot, in different sizes and densities. Rinse out your brush and let your marks dry. Look at each panel and try to see shapes or parts of outlines in the marks you’ve made: the curve of a nose, for example, or the drape of a coat, a tree, whatever. Take a pencil (or inking tool) and add to the marks, drawing what you see in your mind’s eye. Do this for each panel. You might notice that I decided panel 5 was too sparse so I made a few more brush strokes. Now hold the page back and read the six panels in sequence. Is there a story implied there? Look for suggestions of a narrative thread and tease it out by adding to each panel: backgrounds, new figures, dialogue, sound effects. One of your marks may lead to the creation of a character who becomes your protagonist. In that case you may choose to re-draw him in other panels to give the story better continuity and flow. 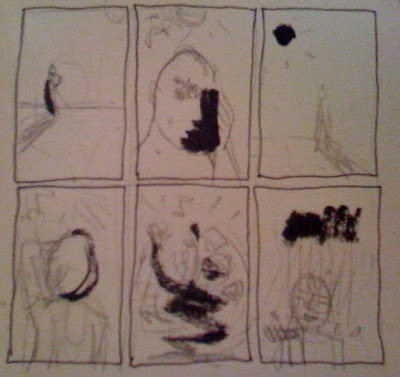 The spot in the third panel and the general barren-ness suggested by the scant marks led to me sketching a figure standing alone in a sun-bleached desert. 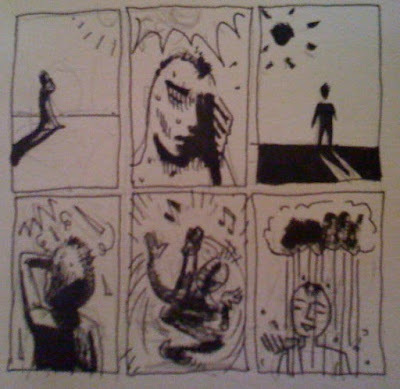 My earliest doodles (not recorded) had the mark in the last panel as a bushy eyebrow of a full-panel face (The influence of that brow can be seen in panel 2). 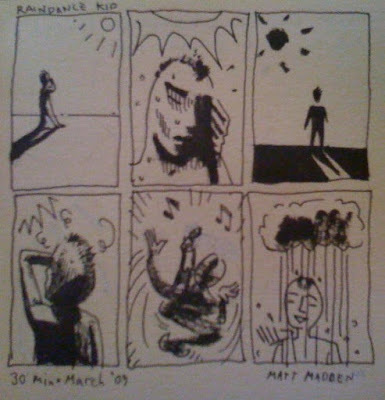 After a while—and looking for some kind of narrative development—I realized that mark could also be a storm cloud, suggesting an opposition to the sun dominating the other panels. The squiggles I added to the fifth panel, a zig-zaggy sort of movement, then began to suggest a rain dance of some sort. I started to ink in my outlines with a pen (Rapidograph, but it shouldn’t matter for this exercise) and to embellish with a brush pen. The backwards C shape in panel 4 eventually led me to give the character a mohawk. This being a warm up exercise, I tried to do it as quickly as possible and as you can see noted below, I did all of this in about half an hour. I had a correction pen (a really neat one I got a Muji which I’m afraid they might not stock in NYC anymore) that I used for corrections but I tried not to be obsessive about it. If you decide to do your own take on this exercise I hope you’ll e-mail it to me or post a link in the comments field. Here's an in-progress, and the completed one. I love the narrative element of this, though. Maybe we'll give it a try at our next local cartoonists' group meeting. Thanks Ben. Yeah, our exercises our variations on the same idea. 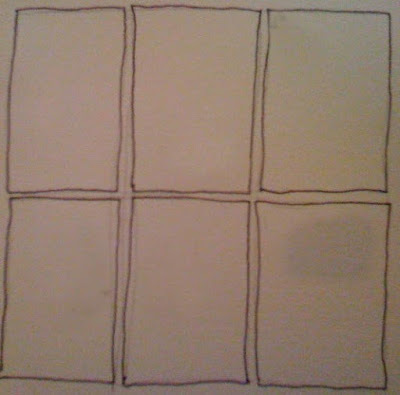 I like the idea of trying to find narrative (I always have stories on my mind) but this exercise could also just generate a grid of drawings like yours. I also like how you seem to be starting from a denser network of scribbles. I found it hard to generate images out of some of my more basic marks and I've been trying to figure out how to strike a balance: maybe have people do at least three marks per panel? I always find myself cheating exercises like this – like I know that I am going to try to turn this into a story afterwards, so it's really hard not to have that colour the way I make these "random" marks in the first part. Maybe that's thinking about it too hard. Here's the link to mine! This was a lot of fun and a very interesting challenge. Kris: nice comic, that's an intense little drama! 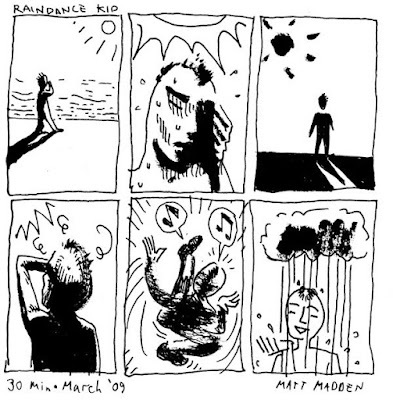 Here's a clickable version of the URL Matt just posted.